Sometimes, unfortunately, it takes an emergency to compel those in charge to acknowledge chokepoints and vulnerabilities in America’s infrastructure, particularly when it comes to railroads. One case in point is the Long Bridge, built across the Potomac River in 1904 (though bridges existed at that location since a century before that) to connect Washington, D.C. with Virginia. The two-track formerly electrified span, now owned by CSX, is the easternmost rail crossing of this major river and the busiest rail crossing, particularly when it comes to passenger traffic. The next rail crossing of the Potomac to the west is 60 river miles upstream at Harpers Ferry (CSX’s ex-B&O mainline) and the one after that is 71 miles upriver at Shepherdstown, W.Va. (Norfolk Southern’s ex-N&W Shenandoah Valley Line between Harrisburg, Pa. and Roanoke, Va.). No estimate has been made as to how long Long Bridge will remain structurally sound without repairs, but its finite capacity is the major factor limiting the growth in frequency of Virginia Railway Express commuter service, the Washington-Richmond corridor, the future Southeast High Speed Rail corridor, and CSX’s capacity to carry containers and other long-distance freight between the Northeast and Southeast. An outbound Virginia Railway Express commuter train crosses Long Bridge beneath blooming cherry blossoms in April 2014. Photo by Malcolm Kenton. The Federal Railroad Administration and District (of Columbia) Department of Transportation (as nearly the entirety of the bridge lies within the District, with the Virginia state line being at the river’s high water mark on the Virginia side) have studied what it will take to future-proof this key part of the East Coast rail network. While the final Environmental Impact Assessment, funded by a 2016 Transportation Investments Generating Economic Recovery (TIGER) grant, will be finished next year, the study has already presented six alternatives (along with a no-build alternative and an option to simply rehabilitate the two-track bridge), each of which involve building two new tracks (either a single two-track bridge or two single-track bridges) then diverting all rail traffic to the new span(s) while the existing bridge is rebuilt. Unfortunately, funding for this substantial project has yet to be identified. While the cost of inaction is not as evident and immediate as the cost of doing nothing about Amtrak’s decaying Hudson River tunnels, a failure of the Long Bridge would greatly hamper East Coast commerce. Luckily, DDOT has already established a working relationship with CSX by collaborating on the recently-completed Virginia Avenue Tunnel rebuild project. Before DDOT began its study, the last time any government had taken any sort of action related to the Long Bridge was in 1942, shortly after the U.S. entered World War II. The Long Bridge’s pivotal role in the East Coast rail network at that time was nearly identical to what it is today (it carried between 165 and 185 daily trains in 1945), and with the nation’s capital being a prime target for the Luftwaffe, military and federal leaders realized that a targeted bombing of the Long Bridge would significantly weaken the U.S., especially since many personnel and materials for the war effort were moving by train. The solution that was arrived at was to install a temporary railroad bridge across the Potomac from Alexandria, Va. to southwest D.C., connecting the Richmond, Fredericksburg and Potomac main line on the Virginia side with the Baltimore & Ohio’s Shepherd Branch (formerly Alexandria Branch) on the D.C. side that was built in 1874. The branch carried once-weekly deliveries of chlorine gas to the D.C. Water and Sewer Authority’s Blue Plains Wastewater Treatment Plant until 2001, when the shipments were deemed a security threat after Sept. 11 and the line was abandoned. Photo of the Emergency Bridge in open position in Oct. 1944 from the Dec. 1946 Railroad Magazine, from the collection of Ken Briers. Within the span of nine months (the plans were drawn up shortly after the bombing of Pearl Harbor), a decommissioned 3,360-foot bridge that carried the Grand Trunk Western over the Saginaw River in Bay City, Mich. was cut into seven sections and shipped by barge up the St. Lawrence River, down the Atlantic coast and up the Potomac, then reassembled. This double-track “Emergency Bridge” opened in November 1942 and carried a number of train movements, all northbound (emergency plans were in place to handle southbound traffic, but were never activated), including up to 86 troop trains each month. According to a Dec. 1946 story in Railroad Magazine, the bridge largely remained in the open position to allow maritime traffic to pass, closing only when a train was approaching. After the bridge was installed, the entire Shepherd Branch was relaid with 100-pound rail and switches, signals and grade crossing warning devices were upgraded. Some scheduled northbound passenger trains were sent across the new bridge as an experiment, the result being that they reached Washington Union Station from Alexandria via the Virginia Avenue tunnel in about the same time as trains crossing Long Bridge. One complication of the routing was that the B&O line passed through the middle of the Army installation then called Bolling Field, just on the D.C. side of the bridge, necessitating that armed guards ride every train to prevent unauthorized access to the facility, and that trains yield to aircraft that zoomed in and out of Bolling at frequent intervals. Shortly after the war’s end, on Nov. 14, 1945, the temporary bridge was withdrawn from service and disassembled two years later. Long Bridge has borne the bulk of East Coast rail traffic for the subsequent 74 years. Will it take another imminent threat of attack or other crisis for those in leadership positions to muster the will to make a generational investment in a replacement bridge that may last for another century-plus? It shouldn’t have to come to that. We just need leaders who have foresight about our infrastructure and consider what is needed to sustain our standard of living, particularly considering the many implications of climate change. Disclaimer: Malcolm Kenton is a freelance contributor to Trains and an independent consultant specializing in writing, research and communications with a focus on passenger rail and transit. His clients include Herzog Transit Services, Inc. and the Association of Independent Passenger Rail Operators. 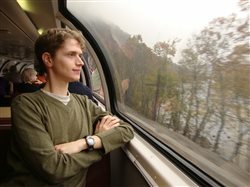 He is also an avid and frequent train traveler. The views expressed in Observation Tower are solely his own and do not reflect the positions or business interests of any of his clients.